We all want our children to have a rich vocabulary. When children are younger we are always pointing out the meanings of words to them. We read aloud to them and define beautiful words as we go. This year, as a Challenge A student in Classical Conversations, my daughter is reading many wonderful books. She reads a book, discusses it with me (and her class), and then writes a persuasive essay (using The Lost Tools of Writing) about a specific issue in the book. I still wanted her to be learning new vocabulary, however, so we needed a simple system that was fun for her, too. When my daughter is reading one of her assigned books she must write down at least 5 words per chapter that are new to her. She looks them up (please tell me I'm not old fashioned by teaching dictionary skills) and writes their meaning on a notecard. 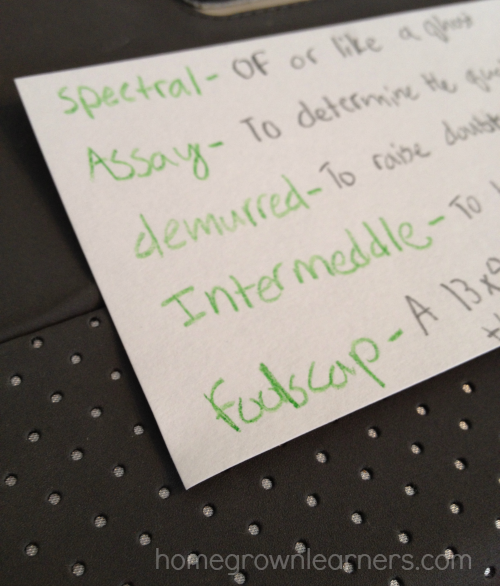 She shows me these notecards and I use them to drill these new words with her after she has finished the book. I also verbally quiz her on their spellings, but not always. I don't want to turn this into drudgery, rather a fun study of words. I'm finding we don't need a fancy vocabulary curriculum - just time tested, quality literature and a stack of notecards will do. How do your children study vocabulary?